Beginning in November, German-themed Christmas Markets are a delightful addition our holiday experience, a bit of traditional holiday celebration to share with all the family. A visit to an authentic Christmas market is sure to engage all your senses and get your body, mind and soul ready for the holidays. In North America as in Germany, even before you arrive at the market area, the wonderful aroma of hot beverages, freshly grilled and fried snacks, and seasonal sweets fills the air. You’re likely to find Glühwein (hot mulled wine), bratwurst grilled to perfection and served in a crusty bread roll, fried fish fillets with tartar sauce on a roll, and other hearty snacks that will warm you up from the inside out in no time. Needless to say, these markets are also heaven on earth for people with a serious sweet tooth, who can choose from Lebkuchen (gingerbread), Christstollen (traditional sweetbread), freshly candied almonds, Christmas cookies and many other delicacies. A visit to a Christmas market also makes shopping for the holidays easy, offering a great array of toys, ornaments and other gift ideas, often hand-crafted by local artists. Each year more cities in the US and Canada are hosting Christkindlmarkts, combining food, music, entertainment with markets for imported and local Christmas specialties into full holiday festivals of German culture. German-themed Christmas Markets in North America from our database are listed below. If you would like your Christmas Market to be listed on this page, please email us. Visit our own The Taste of Germany booth from Nov 23th to Dec 23th for lots of hard-to-find, authentic German Christmas confectioneries, baking ingredients, gift baskets, hand-made pretzels, stollen, glueh-cider and more! 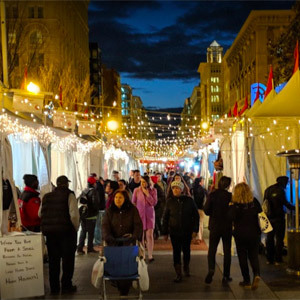 The 14th Annual Downtown Holiday Market returns for 31 delightful days, November 23 through December 23, 2018, on the F Street sidewalk in front of the Smithsonian American Art Museum & National Portrait Gallery between 7th & 9th Streets, NW. Bringing a unique and festive shopping “village” to the heart of Downtown DC, the noon to 8pm market features more than 180 regional artisans, crafters and boutique businesses of ethnically produced goods. For more information, visit the Downtown Holiday Market site. Enter a winter wonderland and find yourself immersed in a world of twinkling lights, music and merriment throughout the holiday season. Shop in our vendor market, take photos with Santa, enjoy live music, taste traditional German foods, sip warm glühwein and more at this charming outdoor festival. For more information, check out this blog article on Alltherooms.com or visit the Cambria Christmas market site. Visit London – at the historic Cow Palace Exhibition Halls! Enter the winding lanes of Victorian London and immerse yourself in a world of music halls, theatres, pubs, dance parties, and charming shops overflowing with hand-made holiday treasures. Enticing aromas of roasted chestnuts and hearty foods fill the air. Discover holiday revelry in this lamp-lit city brimming with over 800 lively and colorful characters from the imagination of Charles Dickens, the pages of history, and the sometimes saucy world of the Victorian stage. For more information, visit the Dickens Fair Christmas market in San Francisco site. The Annual Denver Christkindl Market will take place at downtown Denver’s Skyline Park at the 16th Street Mall and Arapahoe Street. This year the Denver Christkindl Market will once again host vendors, from Germany and other European countries, who offer quality, handcrafted gift items such as traditional hand-carved wooden figurines, handmade candles, and ornaments. Traditional German food, pastries, and candy as well as authentic German beer and Glühwein will be featured. For more information, visit the Christkindlmarkt in Denver site. The Christkindlmarket Chicago is the most popular authentic German winter holiday event in the city of Chicago. The market is celebrating its 14th year in 2009 and is looking forward to welcoming an estimated one million guests to Daley Plaza, in the heart of the city, between Thanksgiving and Christmas Eve. A variety of typical German foods will tantalize the taste buds. The popular savory dishes range from potato pancakes, bratwurst and Leberkäse with sauerkraut to treats for those with a sweet-tooth including European chocolates and baked goods, roasted nuts, and many more delights. The famous Glühwein, which is served in a souvenir boot shaped mug, and the imported German beer rounds off the culinary tour. Enjoy the unique shopping and culinary experience in a charming winter village atmosphere. For more information, visit the Christmas Market in Chicago site. Let yourself be enchanted by the special outdoor atmosphere of the ATLANTA CHRISTKINDL MARKET – the city’s first and largest winter holiday festival at Atlantic Station. Meet and mingle with your family & friends at the traditional German Christkindl Market. For more information, visit the a href=”http://www.christkindlmarket.org/” target=”_blank”>Atlanta Chistkindl Market site. Dubois County, located in Southwestern Indiana, is hosting a fun-filled Christmas celebration. We invite you, your family, and friends to join us for an exciting and memorable getaway before the holidays. Step into Germany with a visit to Ferdinand’s Christkindlmarkt. Sample delectable foods and wines and drive or take the trolley to charming shops within the scenic village of Ferdinand. Four locations, which include two sites brimming with antiques and collectibles, and two locations filled with handcrafted artisan creations are here for your holiday shopping pleasure. Live Glockenspiel, free concerts, food and wine, and lots more! For more information, visit the Dubois County – Ferdinand Christkindlmarkt site. Held at The History Center each year during the Nov/Dec holiday season, the annual Festival of Gingerbread features hundreds of gingerbread creations, from those made by area grade school children to master bakers! Weekend activities during the Festival include visits by Santa and Mrs. Claus, storytelling, gingerbread cookie sales and more. Closed Thanksgiving Day. For more information, visit the Festival of Gingerbread site. At this year’s Christkindlmarkt you will again be able to feast on authentic German foods and stock your pockets with imported holiday goodies including Stollen, Lebkuchen, Advent calendars and Glühwein. Craftspeople display their handmade snowflakes, Santas and elves, floral arrangements, along with real Erzgebirge figurines, smokers and steins. For more information, visit the Christkindlmarkt at Zion Church site. German Christmas sails into Baltimore! Christmas Village in Baltimore is a Holiday market that will be located at the Inner Harbor of Baltimore and will run from Thanksgiving through Christmas Eve (Nov 23th – Dec 24th). Delicious mulled wine, good German beer, 50+ international vendors. For more information, visit the Christmas Village in Baltimore site. 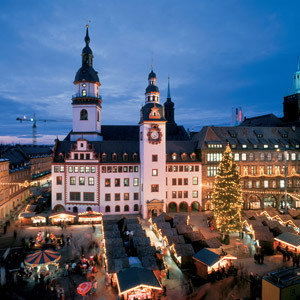 A traditional German Christmas market with crafts, entertainment, German bakery goods, music, Gluhwein served in Kristkindl Mugs, ethnic costumes, Kloppelei lace making, hand-painted ornaments, beeswax Nativities, food and demonstrations in an historic town originally settled by German Immigrants in the mid 1800s. Held at the Hermannhof Festhalle and the Hofgarten on First St and Gutenberg in downtown Hermann. For more information, visit the Kristkindl Markt at Hermannhof Festhalle site. The park’s tree-lined allees are transformed into the city’s premiere holiday shopping destination with custom-designed jewel box kiosks.For more information, visit the The Holiday Shops At Bryant Park site. This day long Olde Tyme Christmas celebration features children’s activities, food, entertainment, parades and much more. For more information, visit the Christmas in Medina site. Come to the German Christmas Stands at the Holiday Markets in New York City. Enjoy the colorful markets with all their holiday gifts from good old Germany and other European countries. There will be a German Bratwurst Stand at both Holidaymarkets this year. For more information, visit the Union Square Holiday Markets in New York Citysite. A true German Christmas Market featuring over 20 vendors, delicious German foods and desserts, imported Christmas candies, handmade crafts, cookies, breads, stollen, St, Nikolaus and of course……music! For more information, visit the Bavarian Club Edelweiss Westchester Christkindlmarkt site. German Music, German Food, German Beers and Glühwein (hot mulled wine). Take your picture with Santa Clause and take your kids to the Petting Zoo. Enjoy imported German Christmas candy and carriage rides through the park. For more information, visit the Cincinnati’s Annual Christkindlmarkt at Germania Park site. Visit the Liederkranz for the annual celebration of the centuries old German Christmas market tradition that originated in Nuremburg, Germany. The Christmas Market will feature authentic German food, desserts, coffee and a Christmas Raffle. For more information, visit the Dayton Liederkranz-Turner Christkindl Marktsite. Once again, the German-American Society of Tulsa (GAST) provides the citizens of Tulsa with the annual presentation of this wonderful custom. The GAST Christkindlmarkt committee and its numerous volunteers transform the GAST Center into a Christmas wonderland which includes many crafters displaying their wares.For more information, visit the Christkindlmarkt Tulsa site. Start off your holiday season with the annual Festival of German Christmas. This Christmas Market is Canada’s original Christkindl Market and it combines the festive atmosphere of heavenly choirs, delicious food and gift shopping. For more information, visit the Kitchener Christkindl Market site. 2018 will mark the 18th year of the event, which features authentic German foods, treats, artisan gifts and live music. The holiday festivities kick-off with the city of Beaverton’s tree lighting ceremony, one of the most impressive city light displays in Tualatin Valley. For more information, visit the Beaverton Tree Lighting and German Holiday Market site. Christmas Village in Philadelphia is an outdoor Holiday market in Center City Philadelphia situated at LOVE Park on the west side of City Hall. From Thanksgiving through Christmas Eve Vendors in 60 wooden booths and two big tents will sell European food, sweets and drinks. Furthermore they offer a great shopping experience with international seasonal holiday gifts, ornaments, jewelry and high quality arts and crafts. The unique atmosphere with thousands of lights, the big Holiday Tree of the City of Philadelphia, the delicious smell of Crépes, gingerbread, Bratwurst and mulled wine will bring you and your family into the perfect Christmas mood. For more information, visit the Christmas Village in Philadelphia . This Christkindlmarket is located in Bethlehem’s historic downtown district. It is a heart-warming holiday event for the whole family featuring live holiday music, great food, children’s rides and old St. Nicholas. For more information, visit the Christkindlmarkt in Bethlehem, PA site. Come and join this festive event in Mifflinburg that features unique handmade crafts and traditional Christkindl treats. The air will be filled with the aroma of roasted almonds, hot chocolate, gourmet coffees and hot-spiced wine. Catch the spirit of the season as holiday music is performed and sample delicious traditional German Lebkuchen (Gingerbread) hearts. For more information, visit the Mifflinburg Christkindl Market site. Enjoy live performances of traditional German Christmas music and songs throughout the day and a special visit by Sankt Nikolaus. For more information, visit the German-Texan Heritage Society Christkindlmarkt site. A German Christmas shopping market featuring unique gift items and antiques from distinctive merchants and artisans.New Braunfels Civic Center. For more information, visit the Weihnachtsmarkt New Braunfels site. Leavenworth has a delightful Kinderchor singing traditional German Christmas songs along with many American favorites. This Christkindlmarket offers great authentic German food like German Bratwurst, Pfeffernüsse and Stollen to satisfy your hunger – as well as American food. Besides that, you and your family can view one of the largest Nutcracker Collections in the world at the Nutcracker Museum. For more information, visit the Christkindlmarkt Leavenworth site. The Osthoff Resort’s 12th annual traditional European Christmas Market, reminiscent of the centuries-old German Christkindlesmarkt, features authentic gifts, toys, ornaments and food specialties from international and regional artisans in timber booths adorned in fresh greens and thousands of twinkling white lights. For more information, visit the Old World Christmas Market site.